To develop and pursue my vision designing and painting public community murals, painted tile, mosaic and mixed-media installations with life affirming themes and continue sharing my knowledge and skills in the collaborative process. 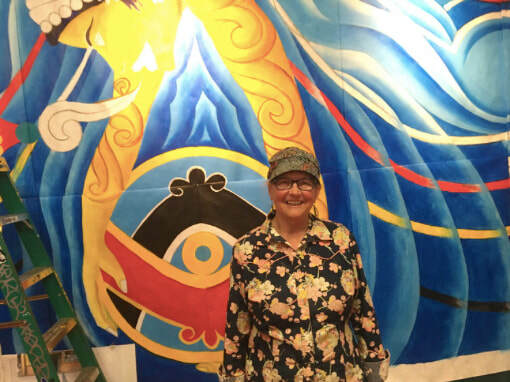 Founding Artistic Director, Precita Eyes Muralists Assoc., Inc., Precita Eyes Mural Arts Center, San Francisco. a non-profit community arts org., 1977-present. SF. CETA Arts Program/Precita Valley Community Center; SF Arts Commission, 1975-79. Wallenberg Alternative High School, SF, 1990; Buena Vista School, SF, 1991; New College of California Arts and Social Change Program, SF, 1993; Balboa High School, S.F., 1995; Mission High School, S.F., 1996; Cleveland Elementary School, S.F., 1993 -1995; California State University Hayward, 2000, California College of Arts 2004, San Francisco Art Institute, 2010, University of San Francisco, 2013, Northeaster University, Boston 2016 and others. S.F. Art Institute 1975, 1988, 1990. University of Southern California 1976. SF Museum of Modern Art, 1979. University of California, Berkeley, 1980. Las Americas Childrens Center, SF, 1982. Urban Skills Center, SF, 1983. George Washington High School, SF and Golden Gate National Park Headquarters, Ft. Mason, SF, 1986. U.S. Postal Service, Main Branch, SF. Mission Branch Public Library, SF, 1988. Raoul Wallenburg High School and World College West, SF, 1989. De Anza College, Cupertino, 1992. Pescadero High School, Pescadero Beach, 1993. Dominican College, San Rafael, 1993. “Utopia Dystopia”, the Third Annual Conference on Feminine Activism and Art, Yerba Buena Center for the Arts, SF, panel discussion, April 1995. S.F. State University, 1996. University of San Diego, 1996. S.F. Museum of Modern Art, 1996. College of Notre Dame, Belmont, 1993-2001. Art and Architecture, AIA San Francisco, 2000. “Mayfair Community Mural Conference; Mexican Heritage Plaza, San Jose, mural workshop, April 2001.DeAnza College, 2006. Pecha Kucha, Estriia Foundation, 2011, Revolution Book Store, Berkeley, CA 2012. Pecha Kucha, Artspad SF, 2012, Mural Foorum, Stockholm, Sweden, 2014, Mural Routes, Toronto, Canada 2015. Tim Dresher, 1991, 1994, 1996; Painting the Towns, by Robin Dunitz and Jim Prigoff., 1998. SF Street Art: Mission Muralismo, 2010.